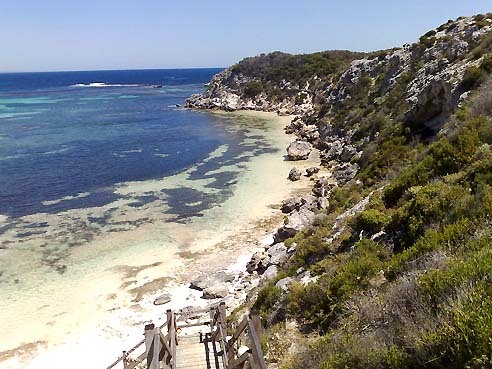 For a place that sounds like old pears that’ve gone furry in the fridge and actually named after the mistaken identity of cuddly quokka as rats, Rottnest Island is disproportionately beautiful. There are no cars here (excepting the public shuttle), just bikes, so you just roll over the hills from one empty beach cove to the next. The sand is silky smooth and the water is so amazingly clear, you just hope the neighbourhood sharks don’t appreciate it as much as you do. 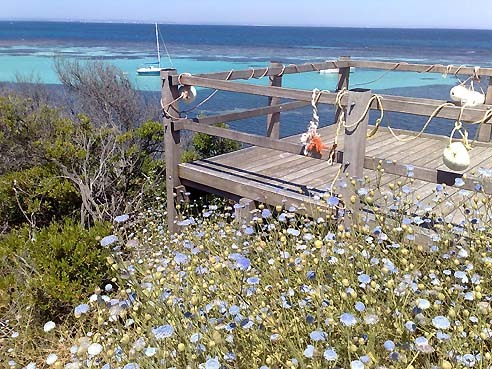 Rottnest is also a great place to go if you’re a big foodie like me. There’s a dreary Dome café chain, an overpriced Tea Rooms, a fish and chippery that needs to change its oil, a pub that puts the kitchen sink on its pizzas, Subway and Red Rooster. And you know you’re in a culinary wasteland when Red Rooster seems like the best option. So when, like me, you’ve found that you’ve pigged out on too many nice restaurants, Rottnest is the prefect place to force you to eat simple again and cook for yourself. In any case, we hit the General Store and stocked up on porterhouse steaks, spuds and vegies for the sides, breakfast essentials for making eggs, French toast, bacon, etc, and a few other essentials. Then we gingerly placed our heavy shopping bag onto the dodgy spring-loaded holder above my bike’s rear wheel, and Matrix-like moves were performed tp get onto the bike without tipping and spilling the contents in back. If there’s anything to be said of wildlife, it’s that they also have an appreciation of home-cooked meals. A local quokka came into the front courtyard of our rented villa and demonstrated a very civilised knack for neatly scoffing crackers with two hands. He was very cute and social, and initially invited, but he overstayed his welcome, so we placed his next cracker outside the front gate and unceremoniously slammed it behind him. Yes, we can be very rude hosts. We also had to learn how to steadfastly guard our sausages on the barbie, because the moment we even thought about looking away, a seagull would swoop down and steal one. As such, we have moved Bin Lanen down to public enemy number four, and placed, in order, seagulls, mozzies and ever-harassing WA summer flies ahead of him. Wildlife harassment aside, Rottnest Island was three days of bliss, and a welcome respite from worrying about where to find the next great meal, and pointing to bloated Buddha bellies from overzealously ordering a bit too much from the menu. Yes, I can feel the outpouring of pity.